Are you looking for a center where your primary school child ( 7 years old to 14 years old ) can be taken care of while you are busy at work after their school ( 1.30pm to 7pm )? Wish that your child reads the Quran daily and have someone ensure that they perform their prayers? 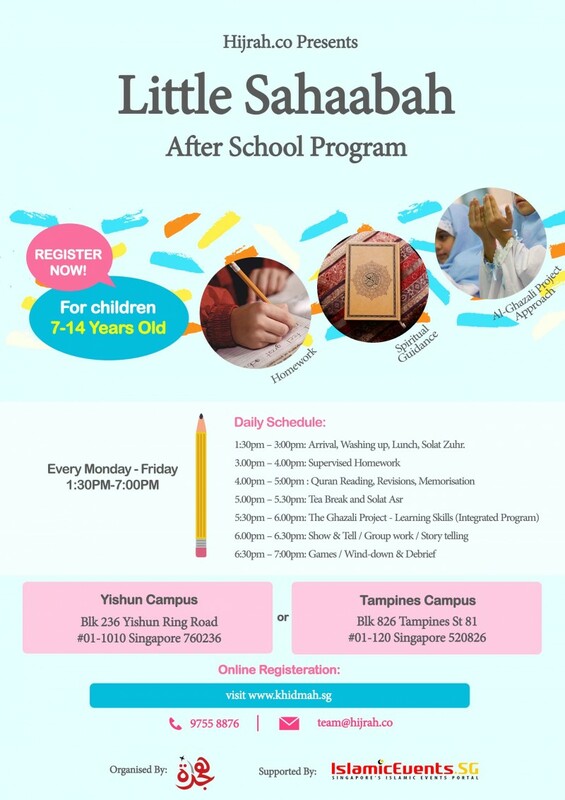 In this program, your child would be guided by a trained teacher with their homework and spelling tests, have daily Quran reading and memorisation sessions with a qualified Quran teacher. Furthermore they will be engaged under a program called Ghazali Project. They will also be taught and encouraged to perform the solat daily and fasts in Ramadan. What is the Ghazali Project? “Shaykh Hamza Yusuf explains, “The Ghazali Children's Project is nothing less than a revolution in developing humans, ethical and committed Muslim youth, who are in dire need of guidance in these troubled times. Imam al-Ghazali is the Proof of Islam, and these teachings, presented in a beautiful life-affirming way, will prove to be a major shift in the way Islam is taught to young people. As a community we owe much to Fons Vitae for bringing them to fruition. Let the transformation begin!”The Ghazali Children's Project aims to install good habits into our children such as humility, patience, love, altruism, gentleness, forbearance, and respect for other faiths while providing children with real and effective tools to address such failings as selfishness, back-biting, arguing, laziness, envy, bragging, hypocrisy, greed, wasting time and pride.In other words, we are shaping your child's character to be a responsible Muslim. Inculcating good habits, sharing with them to be good people by learning manners, instilled responsibilities and much more. schedule will be as follows. * 1:30pm – 3:00pm: Arrival, Washing up, Lunch, Solat Zuhr. * 6:30pm – 7:00pm: Games / Wind-down & Debrief. Interested to put your children into this program? Limited to 25-30 children per center. Q: My child takes the school bus back home. Can it be re-directed to the center? A: School buses may have certain routes that they take. Consult with the bus driver and you might need to change the school bus if it doesn't go to our center. Our staff can standby to receive your child when the school bus reach the area. Q: I am a single Mum. Is there any subsidies for this program? A: We are an MSF subsidise center. We do our best to source for funding to help you to reduce the monthly fees. But not all family can qualify for it. Do register your interest and our team from Hijrah.co will explain to you the various possibilities. Q: My child has ADHD? Is this the appropriate place for him/her? A: We will consider case to case basis. Q: Will parents be updated of the activities happening at the center on a frequent basis? A: Our team are currently communicating with parents through a WhatsApp Group Chat. We are also in the process of working on a better reporting system. More details will be updated to parents in the future. * Our team from Hijrah.co will be contacting you after you made the registration. * Please take note that there are monthly payments when your child is accepted to this program. Q: What is the monthly fees?A: Currently our fees is $350 per month per child. Q: What other costs should I be expecting? i) Deposit: $350 ( Refundable ) - if you withdraw your child before Dec 2018 else it would be used to pay the December 2018 fees. Contact us at 9755 8876 for inquiries. Q: How do I go about Registering my Child? It's easy. Please register with the form below. *Please do not make any payment online. All payments should be done at the centers.